This down to earth wedding in Mumbai had a green theme – from decorations, cutlery to gifts. Reason, the couple wanted to celebrate their love for each other keeping in mind their love for the environment. 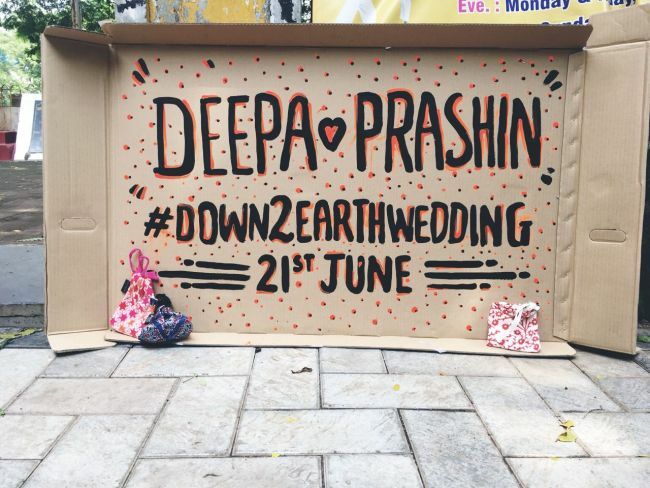 Breaking the conventional norm of ‘big fat’ wedding, a couple from Mumbai – 27-year-old Deepa Kamath and 28-year-old Prashin Jagger decided to tie the knot on June 21 in an eco-friendly way. 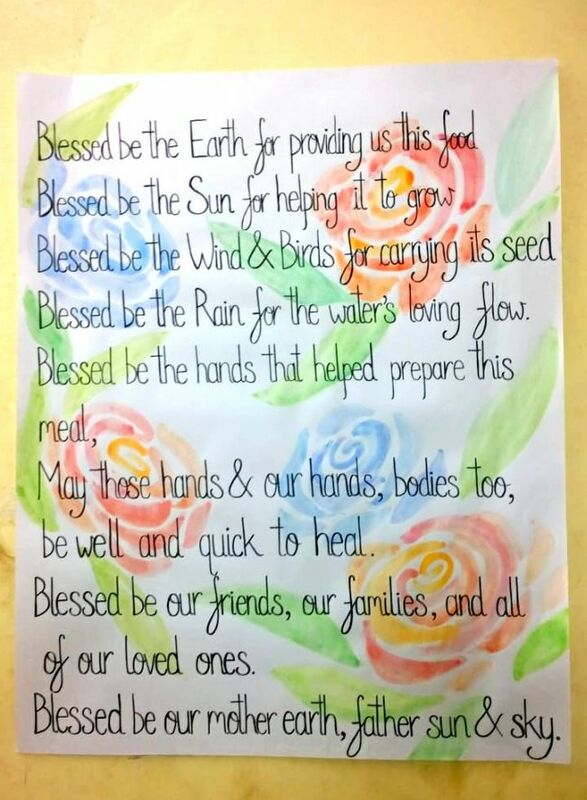 The green wedding had hand-made posters using old papers as decorations with eco-friendly quotes, gifts that turn into plants and cutlery that leave a zero impact on the environment. Our green journey started when Prashin decided to propose to me at my friend’s farmhouse in Kerala. Instead of giving me the usual diamond ring or a gold ring, he gave me a wooden hand-made ring with our initials inscribed on it, said Deepa Kamath while speaking to NDTV. We both are very environmentally conscious, back at home as well, we do our bit by following simple waste management rules – composting, waste segregation, avoiding the use of plastics are some of our daily rituals. So, as a conscious step for the betterment of our environment, we decided to go for a green wedding. As a first step, Deepa who is learning Pali language and Prasin who is a freelance photographer decided to book a local wedding hall that has natural ventilation system and doesn’t need air conditioning. They also ditched the custom of inviting people through wedding invitations, instead opted for E-cards or word of mouth invites. From hall and invites to decorations, Deepa and Prasin decided to opt for minimal flower decorations and hand-made posters using old papers and things lying around with green quotes on it. 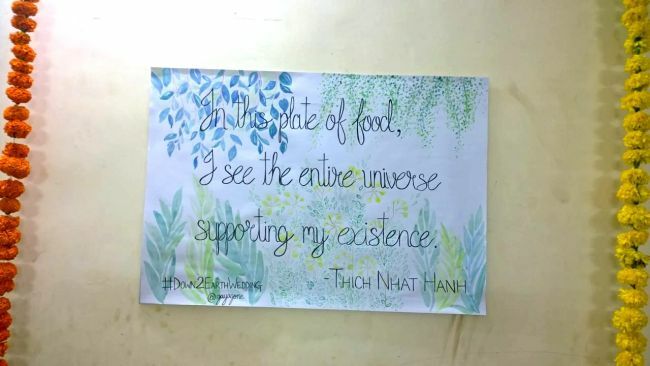 With the help of our few friends, we made these green posters – some with environment-friendly quotes because we wanted to pass on the green message to people coming to our wedding and some had our own memories. Like, our main welcome board was made from LED TV cupboard box, which arrives along with the TV when purchased. It had our names written on it with the wedding date, adds Deepa. Even the food at this green wedding was kept minimal – the wedding consisted of six dishes, each made of seasonal vegetables. “Moreover, leftover food was taken away by guests and given away to the people in need. Not just that, after the wedding, we also gave away flowers used for decorations to our family members and friends, so that they can use them in their pots, as they decompose easily. While, some of the flowers we both used at our home in the compost pit,” adds Deepa. Last but not the least, even the return gifts were well thought of. The couple gave their guests seed balls which they sourced from a Pune-based NGO Bhavtal that grows into a plant. These little goodies were given in a colourful bag that was designed by a local designer using all the waste cloth from his boutique. “The seed balls were in a shape of a normal ball and were made using seeds of the plant, cow dung, and soil. So, the concept is, you throw it anywhere – at your neighbourhood parks, pavements or when you go for treks, to some place where the ball will get water and heat. And, soon it will turn into a plant. 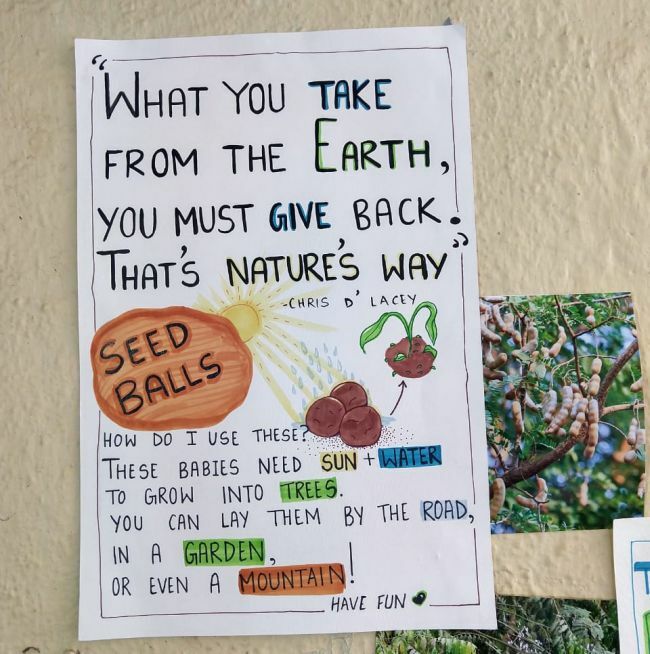 We gave every guest, two seed balls, with a small hand-made note with instructions about how seed ball works. 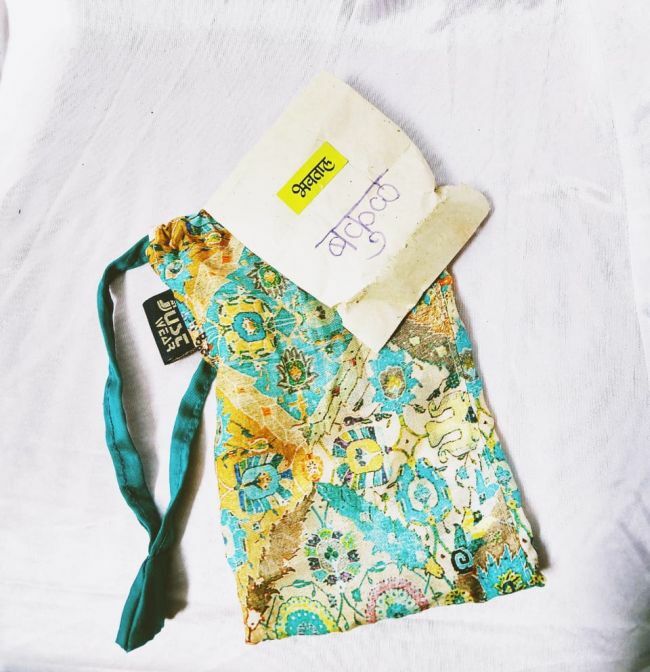 These were further packed in a little cotton pouch which was made using old trash cloth,” said Deepa. We wanted to celebrate our love for each other keeping in mind the love we have for the environment. This is not a concept wedding for us – it’s a way of life for us. This wasn’t done simply for the wedding, this is how we intend to live our life. We hope our green story inspires other couples and people in general, as together we all need to do our bit for the environment. Next Post: Bengaluru Family Sets New Travelling Goals By Going Green. Takes The Zero-Waste Route For Their Trip To The Northeast.